The Wiki activity enables participants to add and edit a collection of web pages. A Wiki can be used by a group, with everyone being able to edit it, or it can be used individually, where everyone has their own wiki. For instructions on adding and editing a wiki page, see Moodle 3: Activities & Resources: Add a Wiki and Moodle 3: Activities & Resources: How to Edit a Wiki. In the General settings, instructors must give the wiki activity a name, but the description is optional. (The description could include instructions or a prompt for students.) Instructors must also choose to make this a collaborative wiki, or give each student their own individual page. They must also designate the title of the first page. The default format is HTML (which provides a robust text editor), but instructors can choose either Creole (a common wiki markup language for which a small edit toolbar is available), or Nwiki (Mediawiki-like markup language used in the contributed Nwiki module). If instructors enable the "Force format," there is not option to change or choose a format when editing a wiki page. 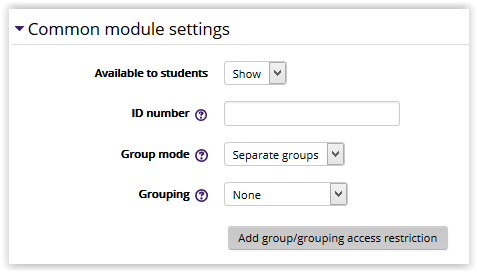 These settings specify the visibility of the wiki for students (Hide/Show), and the group mode and grouping can be designated. The wiki activity can be restricted based upon a date, group, activity completion of another activity/resource in the course, etc. NOTE: If more than one restriction is added, students must meet EACH of the requirements before the wiki becomes available. 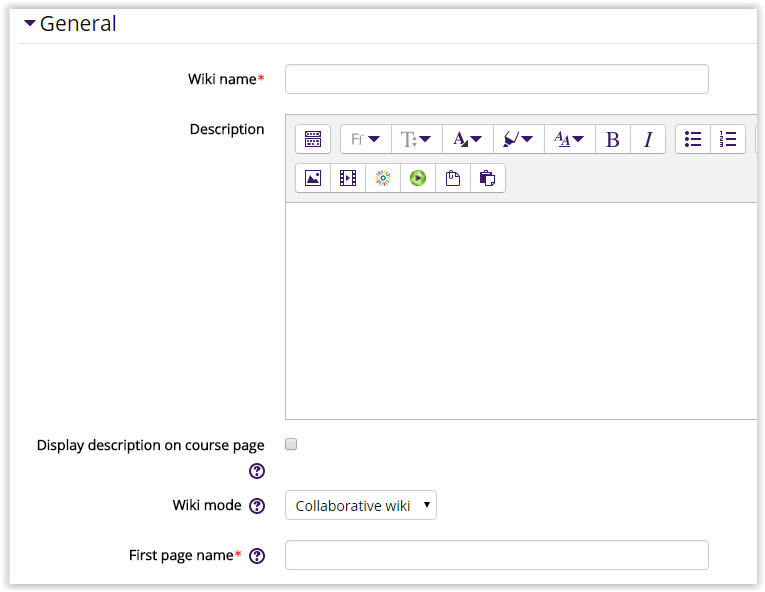 By default, students can manually mark the wiki as complete, but an instructor can change this to be required. If required, the students can be marked complete by viewing the wiki.